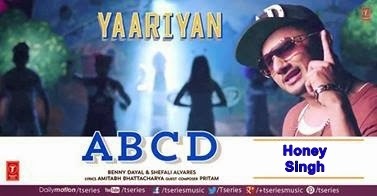 Lyrics of Song ABCD from Movie Yaariyan, Sung by Yo Yo Honey Singh, Benny Dayal and Shefali Alvares. Music is composed by Pritam and Lyrics are penned by Amitabh Bhattacharya. Song Video is Coreographed by Longinus Fernandes and Picturised on Yo Yo Honey Singh, Himansh Kohli, Rakul Preet Etc.